The Miami-Dade County Board of County Commissioners (BCC) adopted a Master Plan for the Miami International Airport (MIA) in 1994 that is the basis of the current Capital Improvements Program (CIP). The primary objectives of the multi-year CIP are to increase Miami-Dade Aviation System capacity, enhance efficiency and safety, reduce delays, maximize non-aeronautical revenues, modernize the facilities, support the needs of a dynamic airline industry, increase air-cargo capacity, accommodate changes in aircraft fleet-mix and complete a multitude of infrastructure and environmental support projects at Miami International Airport (MIA) and General Aviation Airports (GAA). The CIP is one of the largest expansion and redevelopment programs at an operational airport. The total value of the CIP has fluctuated over the years to reflect demand and financial capacity changes. The current amount approved by the Board of County Commissioners is $6.4 billion, not including a list of projects to be implemented in the future based on demand and affordability. The CIP at Miami International Airport includes an expanded and efficient airfield with four runways and several new taxiways, expanded parking, a central collection plaza, additional lanes at upper/lower terminal drives, and enhanced connections to the surrounding expressways and the MIC/Car Rental Center. The terminal is expanding from 3.5 million to 7.4 million square feet with 101 international gates and 27 domestic gates, for a total of 128 gates with 555 ticket counters and 120 self service devices (SSD). Separate Federal Inspection Services (FIS) locations in North, Central and South Terminals will have the capacity to process 7400 passengers per hour. The CIP implementation is progressing at a rapid pace for substantial completion in 2011. Projects completed and in use include the new Runway 8L-26R, new taxiways, taxi-lanes, midfield apron improvements and NAVAIDS; two new fire stations; additional parking, the Central Collection Plaza; sub-surface utilities infrastructure and chilled water capacity for air-conditioning; a new International General Aviation Center; seventeen new cargo buildings comprising a total of 2.7 million square feet; portions of North Terminal, Concourse H and other components of the existing terminal; and dozens of new concessions including restaurants, gift shops and other amenities for passenger comfort and convenience. The New South Terminal, with 27 gates and an adjoining cruise ship bus depot, a $1.1 billon dollar facility, started operations in 2007. North Terminal, a $2.85 billion one mile long facility, has been partially completed and is in use by American Airlines and its “Oneworld” alliance partners, and construction on the remainder of this 48 gate facility continues. Additional North Terminal gates will be phased-in operation periodically as construction is completed while the entire project progresses towards substantial completion in 2011. The Miami-Dade Aviation Department has worked with the Florida Department of Transportation (FDOT), Tri-Rail, the Miami-Dade Expressway Authority (MDX), Miami-Dade Transit and Public Works Departments to improve access from and egress to the surrounding expressways, Tri- Rail, and Metro-Rail. 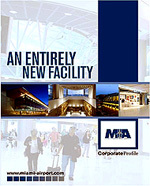 The Miami Inter-modal Center (MIC) /Car Rental Center under construction by FDOT upon its completion in 2009-10 will enhance connections between Miami International Airport and surface transportation systems surrounding the airport. Rental car companies, currently scattered in several different facilities, will be consolidated in a single customer-friendly facility connected to MIA by an Automated People Mover (APM) system. A new viaduct over NW 25th Street will allow cargo trucks direct access between MIA and the Palmetto Expressway without having to navigate through roads crowded with local traffic. With the new 1.7 million square foot South Terminal now open and the 3.2 million square foot North Terminal scheduled for completion in 2011, MIA is prepared for the future.